Deep fry our Frozen Pork Skin on medium flame till it turns crisp and then, enjoy its unique taste and flavor. 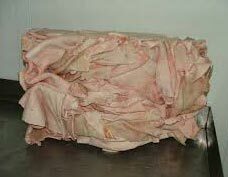 We are one of the leading Exporters and Suppliers of Frozen Pork Skin from Thailand. We procure Frozen Pork Skin from the trusted vendors of the market. We have spread our network worldwide and that is why, it has been an easy job for us to deliver retail as well as bulk orders within the promised time frame.